Home | Support | Help Articles | How to order the correct raised toilet seat for your toilet. We get a lot of questions about the raised toilet seats so we decided to create this help page that should answer a lot of them and help to ensure you get the correct product. Raised toilet seats make life easier for anyone that has had a hip replacement, arthritis or other disability that makes it hard for them to rise from a seated position. A 2" to 6" rise in seated height makes a huge difference in how easy it is for the person to get up. 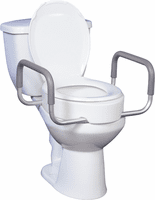 Toilet Seat Riser / Raised Toilet Seat - This is a device that goes on top of your commode. You remove the factory seat and attach the new raised seat. Some are designed to be used as a seat and some are designed to reattach your factory seat after the riser is in place. Toilet Base Risers - This is a device that goes between the floor and the bottom of the commode. Basically it is just a spacer that lifts up the entire commode. While this is the most ascetically pleasing look it will require the services of a plumber or handyman to install. Now, if you have decided that a toilet seat riser or raised toilet seat is the better option for you, then you will need to know the options available. 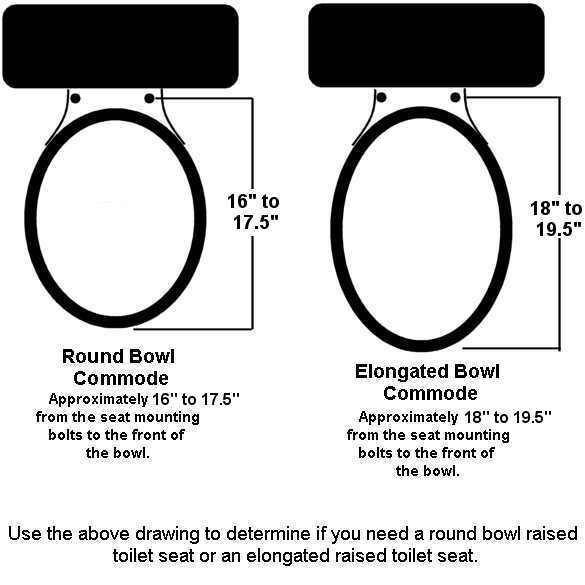 Do you have a round bowl commode or a elongated bowl commode? Here a sketch we made up to make it easy for you to determine "Round" or "Elongated"
Then you will also need to choose if you want arms on your seat or not. The arms just give the user something to push up off the seat with. A grab bar placed within arms reach of the commode will also suffice to help the user rise to a standing position if you do not have the room for a riser with arms. If you have any further questions you can call our customer service team at 1-800-804-9549 and we will be more than glad to help clear up any remaining questions that you may have. We are open 8am-5pm CST Monday thru Friday.